NEWSgrist - where spin is art: Blown Away at "Out of the Blue"
Blown Away at "Out of the Blue"
Artworks inspired by natural phenomena are the impetus of a new show. It used to be that creative people tapped into the metaphorical possibilities of strange weather. 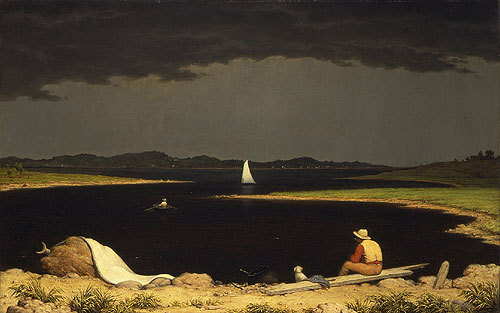 I'm thinking in particular of Martin Johnson Heade's gorgeously glowering painting, Approaching Thunderstorm, which is said to have reflected his sentiments about the impending Civil War. Martin Johnson Heade (1819–1904). Approaching Thunder Storm, 1859. In these more self-absorbed days, however, human creativity itself is increasingly compared to atmospheric and geological phenomena. "Out of the Blue," a group show of 22 contemporary artists at the Abington Art Center, asks one to consider the creative process as a kind of natural phenomenon. Why not? Artists Joy Episalla and Joy Garnett, who conceived the exhibition, and Abington Art Center director Amy Lipton, who organized it, have tested their thesis with a broad range of works. 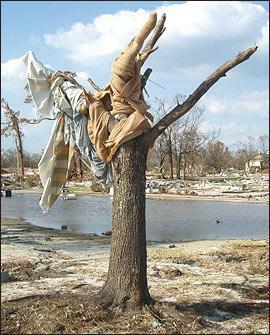 Among the most clearly atmospheric and geological-event-evoking works include Diane Burko's painting of a volcano in Iceland; Emily Brown's painting of a jet trail floating in an otherwise blue sky; Dawn DeDeaux's photograph of a tree ravaged by Hurricane Katrina; and Garnett's two paintings of volatile skies, from her aptly titled "Strange Weather" series. in the Abington Art Center's "Out of the Blue" exhibition through May 6. The show's more abstract works are phenomena in themselves - among them, a pile of cellophane-wrapped candies by Felix Gonzalez-Torres installed to look as if they were spilling, lavalike, out of a fireplace; a shiny blue Mylar and urethane-resin wall piece by Carrie Yamaoka that resembles both a TV screen and a view through a jet's window; and a sculpture by Fluxus artist Geoffrey Hendricks that is composed of a suspended bird cage and watercolor paintings. Fortunately, the exhibition does not take itself too seriously. It allows for the inclusion of a knitted baby's cap by Andrea Zittel and a molded plastic Frosty the Snowman, as well as museumlike glass vitrines containing such influential ephemera inspired by natural phenomena as Richard Long's artist book, A Walk Past Standing Stones (1980); a photograph of Robert Smithson's Glue Pour, 1970 by Christos Dikeakos; and a 1969 book, Airborne Camera: The World From the Air and Outer Space, by Beaumont Newhall. Heade would have been blown away. Abington Art Center, 515 Meetinghouse Rd., Jenkintown, 10 a.m. to 5 p.m. Tuesdays through Fridays (Thursdays to 7 p.m.), 10 a.m. to 3 p.m. Saturdays. Through May 6. Information: 215-887-4882 or www.abingtonartcenter.org.